This site may include SPOILERS for the Hunger Games trilogy by Suzanne Collins. Anything that includes spoilers will hopefully be marked so, but the staff can't be positive this is the case. 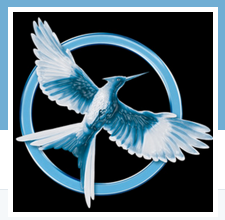 Mockingjay Power is a free forum where you roleplay in the Hunger Games, try to win and become a victor, or, if you are brave enough, rebel against the Capitol. One will be chosen as the Mockingjay. Many will not make it through. What will your role be??? 10. Mags - Died when Katniss couldn't carry her and Finnick had to carry Peeta, she ran into the poison fog after kissing Finnick on the forehead. 9. Madge - Died when district 12 was blown up by Snow and the Capitol. 8. Portia - Died along with all the other stylists from the Quarter Quell. 7. Cinna - Died when he was killed for making Katniss into the Mockingjay. Katniss was stuck in her tube and couldn't help, she could only kick and scream. 6. Commander Boggs - Died when his legs were blown off. 5. Mr. Everdeen - Died when the mine he was working in blew up. 3. Rue - Died when Marvel hunted her down and killed her by sticking a spear in her abdomen. 2. Finnick Odair - Died when Squad 451 was underground and running away from mutts, and mutt killed him. » 29th Annual Hunger Games Tribute Ranking Chart! » Interview with Travis Davenport! » Who could that be? » When will the Games begin? » District 11: African Americans? » Welcome our newest Peacekeeper!!! » Sign up to be a Peacekeeper or Gamemaker!